We are Best Newcomer Accelerator 2017! 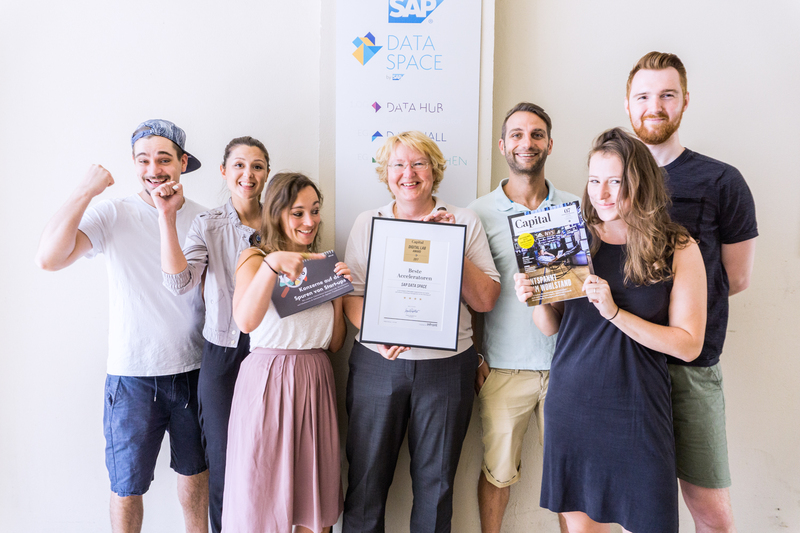 Read an Interview with Eva Zauke, Head of the SAP IoT Startup Accelerator, who received the award “Best Newcomer Accelerator 2017” for the Berlin and Palo Alto based startup program. Eva Zauke heads the SAP IoT Startup Accelerator. The program is part of SAP’s plan to invest $2.2 billion in the Internet of Things by 2020. Furthermore, Eva is COO and heads Cross Product Management for SAP’s Line of Business IoT & Digital Supply Chain. Eva, congratulations on the award you received. 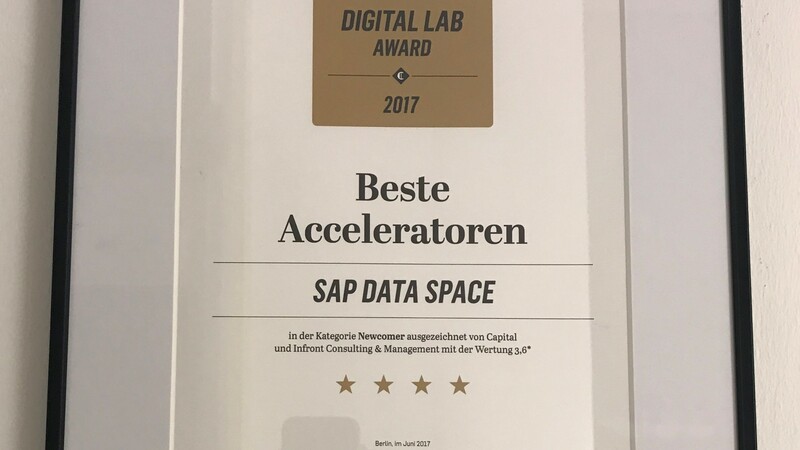 The SAP IoT Startup Accelerator is Best Newcomer Accelerator 2017 due to a study of Capital Magazine. Can you tell us more about it? Thank you, I am extremely proud. As you know we are a pretty young program. We started in December 2016 therefore it is a great honor to receive this award. Last year Capital Magazine approached us for an interview. They asked questions on our mission, our approach, how we are connected to the ecosystem in general and especially in Berlin. They wanted to know how we are working within SAP and how we are working with customers and partners. They did the same interviews with 34 other digital labs and accelerators in Germany. Our approach must have impressed them as we received the prize for the Best Newcomer Accelerator 2017 yesterday. I am extremely happy and proud of the whole Accelerator and Data Space team who contributed to the success. At the award ceremony, they asked you why SAP works with startups. What did you answer? When you look at the award ceremony there were some pretty prominent companies in the room promoting their startup programs – Daimler, Allianz, Axa, ProSieben Media, Axel Springer. There was some astonishment that SAP is investing in a startup accelerator focusing on IoT. They know SAP as a software provider for their companies, but now we have kind of a different spin, because we are recognized and visible for driving innovation with startups and customers. They actually asked two questions: The first one, why we are working with startups? The answer is simply: to complement our portfolio and drive customer success, but also to ensure that our products are successful in the market. This is an opportunity to bring innovation to SAP and to learn about innovation in IoT and Digital Supply Chain. The second question was aimed at us for being a development accelerator with the strong focus on product development. I told them, we are the guys who don’t have money. We are not funding startups. When startups need money, they go elsewhere, we are the ones who give startups access to customers. This is also a strong ingredient of our business model. When we established the accelerator, we interviewed many startups and they told us what they really needed, access to customers. This is something we like to think SAP is really good at! For 45 years we have been successful with our customers and we know how to scale and drive innovation. We are part of, and sponsored by, the SAP development board area with an emphasis on product and innovation. Therefore, our clear focus is on being a development accelerator and being strongly product focused. Since you just started in December last year, what are the next steps? First, let’s congratulate the team and celebrate the award. It’s high visibility and gives us a very prominent position. I’m extremely proud and happy and I’m thankful and honored and humbled by what the team has achieved in such a short time frame. But as you say, this is also a starting point for our next steps and taking this to the next level. We were asked yesterday if we want to be part of the study next year. We clearly will be, and trust we will prove our sustainability. So, what will you see from the accelerator in the next month? You will see more engagement with startups. Especially high touch in building cases and proof of concepts. You will see an increased visibility for SAP on innovation, IoT and Digital Supply Chain, and successful costumer cases and costumer success stories, in addition to events and partnerships with other accelerators. We are already well connected in Berlin and with some of the accelerators we have started co-creation cases. When you talk about the team, who is the team of the IoT Startup Accelerator? Talking about team, I would take a broader perspective and consider also the SAP IoT development and product units as part of the team. They are sponsoring co-creation cases. When we started this whole endeavor with the startups, the reaction at SAP was overwhelming and it continues. I get offers from colleagues from different areas of business. From sales, from marketing, from development, SAP organizations who want to mentor or sponsor startups. Currently colleagues are helping to coach the startups, in terms of creating successful business models, technology, or presentation skills as Gabi Herzog is doing. So, there is an extended team of volunteers and sponsors here in SAP. This makes me really proud and grateful for the colleagues who offer support and are coming to Berlin and sharing their experience and expertise with young companies that are just starting. Talking about global support and success. We have the Israel based startup Loginno that just got invited to pitch in front of Bill McDermott. They were supported by our colleagues in Palo Alto. So, we have projects everywhere and we are happy to be able to support the cases which are interesting and promising, and of course winning the award was a very nice way for all the hard work of the team to be recognized! The study for the Digital Lab Award will appear in the July issue of Capital Magazine. The accelerator study can be found here. For news on the Accelerator go to their Twitter Channel and Youtube. Wow, this is great news! Congratulations to the team and Eva!